Porridge is one of the best breakfasts you can have when you have a busy day ahead, particularly if you have an active job where you are on your feet all day. Finding ways to change up your porridge and making it more interesting is always fun and make it more enjoyable. 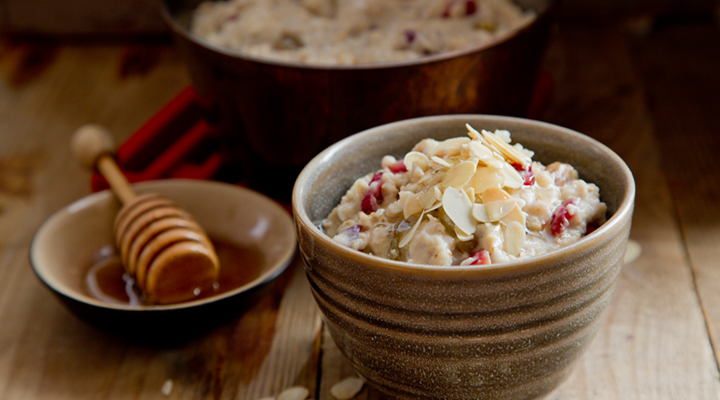 Adding coconut and toasted almonds is a simple way to make a delicious porridge for breakfast. 2. Place the oats, milk, water, coconut (if using), sultanas and cranberries in a medium-sized saucepan and set over a medium heat. Cook for 7 to 8 minutes, stirring regularly. 4. Once the porridge is cooked through, divide it between two bowls. Scatter over the toasted almonds and finish with a drizzle of honey and your breakfast is ready to serve. If you’re watching your fat intake, omit or cut back on the coconut and almonds. Tried this it is yummy, I also like with pineapple.